My involvement with clay began in 1996 when living and working as a gardener in Sussex. I had recently stopped my pastime of wood turning after ten years due to health problems caused by wood dust and was looking for a new medium in which to work. 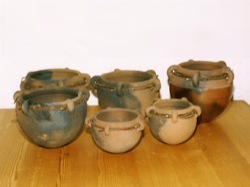 I obtained some clay from a local brickworks and made some pots which they fired. I was soon hooked on clay and with a second-hand wheel and a small kiln, proceeded to learn how to make pots. I attended an ‘Introduction to Ceramics’ course in the evenings and borrowed books from the library. It was not long before I was producing saleable pots which I took to craft fairs. 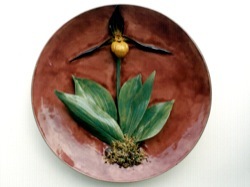 Most of my work was thrown earthenware which I glazed with ready-made glazes. I was frustrated at not being able to throw the shapes that I really liked and gradually changed to coiling as my preferred technique. Eventually, in 2000, I moved to Cornwall with my wife Carole to continue my career as a gardener on the picturesque Lizard Peninsula. I spent many years making pots by the coiling method as I felt that greater control over pot thickness and shape could be had. However I have recently gone back to the wheel and am slowly improving my throwing skills. This is partly to speed up the making process and to get back to what I consider ‘proper’ pottery. I admire potters who are experts at the wheel and I feel that I should be able to throw better than I currently can. 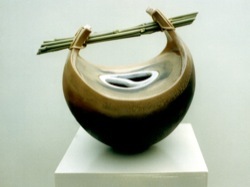 Some of my pots are part thrown and finished by coiling and throwing the coils. Sometimes I use local clay that I either dig or acquire from excavation sites. I enjoy the challenge of turning raw clay into beautiful pots. It is surprising how local clays vary: from the Lizard, the clay fires to a rich red colour yet further around the coastline a deep brown. As I am a full-time gardener my pottery output is low. 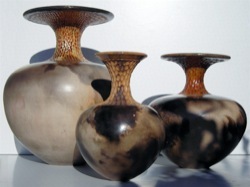 However, this allows me to produce quality pots that are individual, and a pleasure to own. Inspiration comes from many sources, I like the flowing lines of the Art Nouveau period, classical pot shapes that are so pleasing to the eye, and as a gardener of over thirty years, plant forms and the beauty of things found in nature. Living a quarter of a mile from the sea and going to Falmouth regularly has reignited an interest in things maritime. When i was 15 years old I had intended to join the Roal Navy but failed the medical. I had been a sea cadet for four years and been on many courses at naval stations in the UK. A fellow cadet spent some months on a sail training ship and I used to enjoy his talks of life aboard on the high seas. 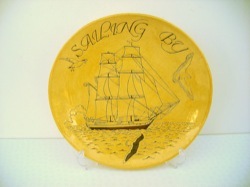 I still have a fascination for tall ships and often incorporate them into my pottery designs. Having to rethink my career, I worked as a groom at a stables for two years and on bumping into a school pal one day, I was encouraged by him to enroll at agricultural college. This I did and learned how to equip myself for my future career as a landlubber! Good job I did as I met my future wife while at college. I worked on various farms for eight years, mainly with dairy cows, and on getting married and living in a tied farm cottage with a large garden, I soon became interested in horticulture. I decided to retrain in this subject and became a gardener on a small estate where I had twenty-one lovely years that unfortunately ended in the estate being sold and me being made redundant. I decorate my pottery with horses, cows and gardening themes as a result of my work experiences with these subjects.